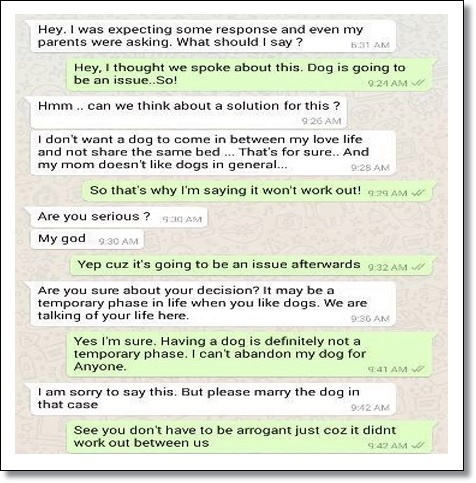 Bengaluru, India – A woman turned into social media’s newest rage after she turned down a marriage proposal because the prospective groom had a disliking for dogs. Soon after Karishma Walia posted her final WhatsApp conversation with her suitor on Facebook, it went viral and created a buzz on social media. Originally from Bengaluru, Karishma currently works with Delloitte India in Gurgaon. “It was an arranged marriage set-up. This guy was good to talk to, well-to-do and pretty good looking, but when I told him that I wanted to bring my dog with me after marriage, he wasn't keen on it,” Karishma Walia was quoted by Times of India as saying. Karishma, a passionate animal lover, did not think twice before clearly indicating how much Lucy, her dog meant for her. Incidentally, Lucy even shares her surname – Walia. “He couldn't digest the fact that a dog can be someone's priority. 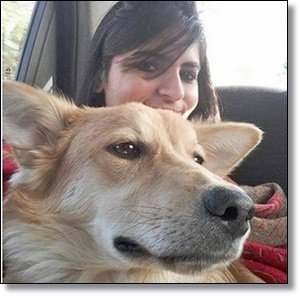 I am OK with not marrying, but I am not OK with abandoning my dog,” said Karishma. While people are lauding her for taking a stand for her loving pet, Karishma’s parents told her that they still think that her decision was wrong and that the guy was an excellent match for her.